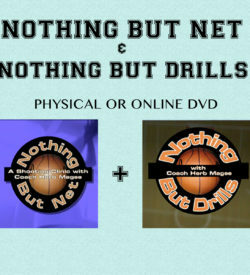 Nationally recognized as a shooting expert, has tutored numerous professional players including Hall of Fame member Charles Barkley, Orlando Magic standout Jameer Nelson, Boston Celtics guard Sebastian Telfair and New York Knicks forward Malik Rose. Conducted shooting clinics around the country and in Italy and Puerto Rico. Basketball. Hoops. Roundball. Whatever you call it, the object is simple – put the ball through the hoop. Nothing is more fundamental to the game than shooting, but shooting is an elusive skill. To be successful, you must first learn the basics, and for that you need a teacher. Now you are about to meet the best. 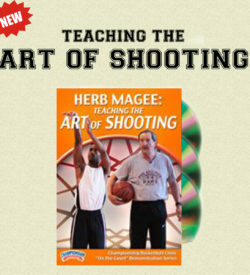 The man who teaches the pros –Herb Magee. Coach Herb Magee is a man of many titles and the recipient of many accolades. He’s been nicknamed “The Shot Doctor”, he’s been inducted into the Naismith Memorial Basketball Hall of Fame, he’s received the National Coach of The Year Award TWICE, he’s even won more than 1,000 games (just one of two NCAA coaches in history to do so). But his favorite professional title is simple – “Coach”. Perhaps that’s the reason he never accepted that offer to play professionally with the Boston Celtics or even coach in the NBA or for more visible Division I schools (Philadelphia University is a Division II school); after all the deals were presented to him. On more than one occasion. No, to Magee, coaching meant staying right in Philadelphia where he was born and raised and where his family lives now. Luckily for him, it also meant spending 48 years coaching at the same school where he played. He says there was never a doubt in his mind that he would ever leave the “City of Brotherly Love”. Today, Magee forges forward with the Rams, achieving success by playing one game at a time. In the off season, he can still be found on the basketball court, only with a much younger group of players as he continues his legendary Herb Magee Shooting Camps. As the most respected and highly sought-after basketball camps in the region, it is estimated that he has coached tens of thousands of athletes over the years…some going on to become Division I players themselves. Magee has also been known to provide private coaching to elite professional players including Charles Barkley, Malik Rose and Jameer Nelson among many others. But Magee isn’t impressed by any of these stats or the big star names he’s associated with. Because if you ask him, he’ll just tell you it’s all just part of his title – “Coach”. 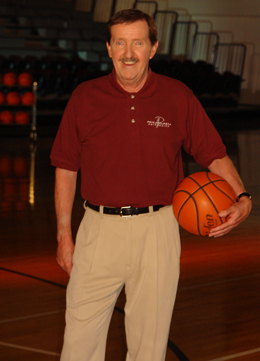 On April 4, 2011, Herb Magee was selected to be enshrined in the Naismith Memorial Basketball Hall of Fame as part of the Class of 2011 on Aug. 12, 2011. Legendary Men’s Basketball Head Coach Herb Magee is in his 51st year at Philadelphia University and just completed his 49th season at the helm of the Philadelphia University men’s basketball program. During the 2010 season, Coach Magee passed Coach Bobby Knight’s record with his 903rd win on February 23, 2010, and became the all-time NCAA wins leader. Previously he passed former Kentucky Coach Adolph Rupp’s NCAA record with his 877th win and former North Carolina coach Dean Smith’s NCAA record of 879 career wins. In 2010, the Philadelphia University Rams went on to the NCAA Sweet Sixteen. Magee became the number one, all-time Division II men’s basketball coach in NCAA history on February 1, 2007, when he earned his 829th win against Wilmington College, breaking the previous mark of 828 held by legendary Winston-Salem State Head Coach Clarence “Big House” Gaines. A two-time All-America selection as a player with the Rams, Magee finished his career as the school’s all-time leading scorer with 2,235 points. While he has since been passed by Randy Stover (2,369 points) in 1992 and Tayron Thomas (2,414) in 2006, Magee still holds the school record for scoring average in a season when he poured in 29.1 ppg in the 1961-62 season – before the three-point shot. Along the way, the Rams posted a 75-17 record that included the Eastern Regional Championship in 1963 under Head Coach Bucky Harris. Following graduation, Magee was drafted by the Boston Celtics with the 62nd pick of the 1963 NBA draft. However, he opted for a career in coaching and he joined his mentor, Harris, as an assistant coach at then-Philadelphia Textile. Magee became the head coach in 1967 at the age of 25 and guided the Rams to a 21-6 record in his first season. In his second season, Textile posted yet another 20-win season, going 20-5, but it was his third year as head coach that made history. After losing two of their first three contests to begin the 1969-70 season, Magee’s Rams won 28 straight games en route to the NCAA National Championship. In the title game, the Rams defeated Tennessee State, 76-65, and the team finished with a 29-2 mark. For the season, the Rams’ average margin of victory was 24.5 points. In his 44 years as head coach, Magee has taken his team to the NCAA Tournament 25 times. In addition, he has had 30 twenty-plus win seasons and one 30-win season.